Sixt Ukraine gives everybody 20% discount on car rental in Ukraine! How can you get it? On Tuesday 02.14.2017 from 12:00 till 16:00 call our call-center +38 044 383 000 6 and book a car! Say the code phrase "Happy Hours" and get 20% off car rental! 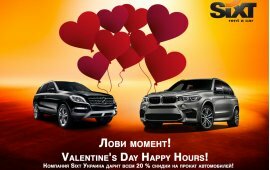 Don't miss Sixt Ukraine "Happy Hours"! * Discount does not apply to special rates and operating rentals, discounts are not cumulative.